"The wreckage of the space shuttle Columbia lies on a grid in a hangar at the Kennedy Space Center in Cape Canaveral, Fla., Tuesday, March 4, 2003. The shape of the orbiter on the grid is with the nose in the foreground, the front landing gear can be seen in the front center of this wide angle elevated view. 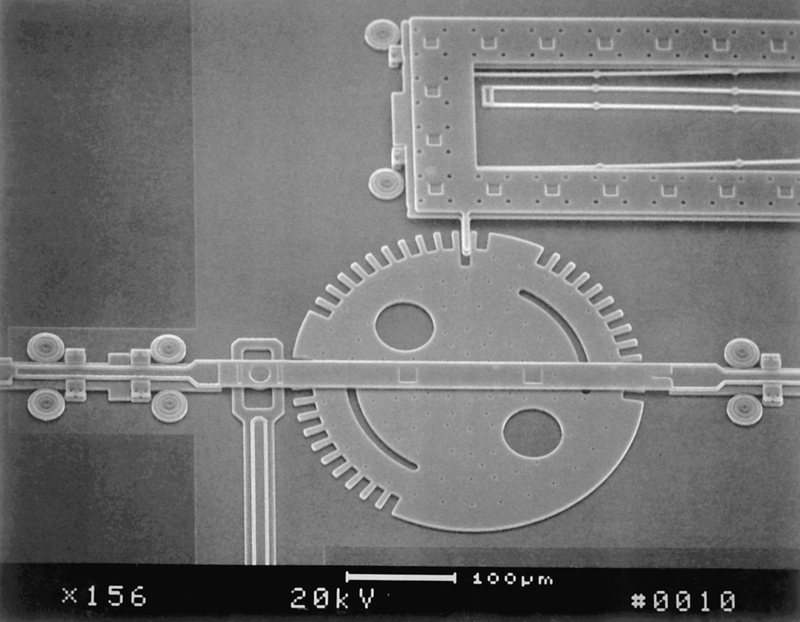 (AP Photo/NASA, Kim Shiflett)"
This is totally idiotic from a security standpoint (this dingus is equivalent to a hard-to-peel smartcard with a private key on it) but microscopic machines are still cool. "ENABLED CODE WHEEL -- One of six code wheels is shown here in an enabled position after the correct code was entered. The wheel is 300 microns in diameter, about the size of the period at the end of a sentence in a standard newspaper." NEW YORK (Reuters) - A lawyer was arrested late Monday and charged with trespassing at a public mall in the state of New York after refusing to take off a T-shirt advocating peace that he had just purchased at the mall. According to the criminal complaint filed on Monday, Stephen Downs was wearing a T-shirt bearing the words "Give Peace A Chance" that he had just purchased from a vendor inside the Crossgates Mall in Guilderland, New York, near Albany. "I was in the food court with my son when I was confronted by two security guards and ordered to either take off the T-shirt or leave the mall," said Downs. When Downs refused the security officers' orders, police from the town of Guilderland were called and he was arrested and taken away in handcuffs, charged with trespassing "in that he knowingly enter(ed) or remain(ed) unlawfully upon premises," the complaint read. Downs said police tried to convince him he was wrong in his actions by refusing to remove the T-shirt because the mall "was like a private house and that I was acting poorly. "I told them the analogy was not good and I was then hauled off to night court where I was arraigned after pleading not guilty and released on my own recognizance," Downs told Reuters in a telephone interview. Downs is the director of the Albany Office of the state Commission on Judicial Conduct, which investigates complaints of misconduct against judges and can admonish, censure or remove judges found to have engaged in misconduct. Calls to the Guilderland police and district attorney, Anthony Cardona and to officials at the mall were not returned for comment. Downs is due back in court for a hearing on March 17. He could face up to a year in prison if convicted.